It started with a "selfie": a self-portrait picture of 16-year-old Mohammad al-Chaar, who was killed in a Beirut car bomb, has sparked a mini political protest by Lebanese citizens. 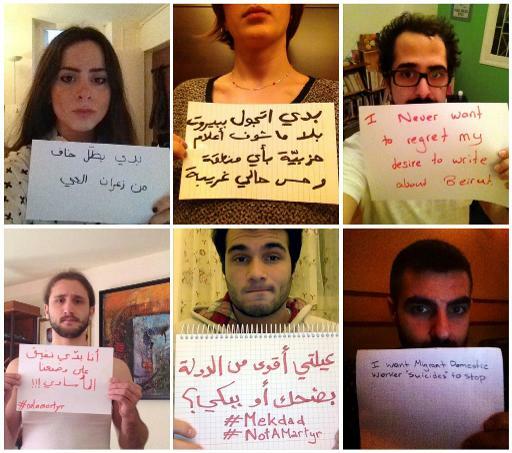 In dozens of pictures posted on Facebook and Twitter, young Lebanese hold up signs with a personal message and the hashtag #notamartyr, protesting the cycle of political violence in their country. The “Not A Martyr” campaign sprung up after Chaar was killed in a December 27 car bombing that targeted moderate Lebanese politician Mohammad Chatah. Moments before the explosion in downtown Beirut, the teenager had posed for a selfie with his friends. A day later, he died of his injuries in hospital. Angered and appalled by his death, a group of young Lebanese started a protest page on Facebook. “We can no longer normalise the persistent violence. We can no longer desensitise ourselves to the constant horror of life in Lebanon,” the page reads. “We are victims, not martyrs,” adds the page, rejecting the notion that innocent bystanders be labelled in the same way as those who chose to die for a political or religious cause. More than 7,000 people have “liked” the page, and hundreds have posted their own selfies. “I want to live for my son, not die for my country,” reads one message with a photo of a woman kissing her young son on the beach. “As a future doctor, I hope that none of my patients are victims of war, bombings, politics or religion,” reads a hand-scrawled message. Dyala Badran, a 25-year-old Beirut resident, was among the first to respond to the campaign, posting a selfie on her Twitter account on December 30. She looks into the camera, clutching a small sheet of white paper with the message “I want to bring the murderers to justice” written in black, and the word justice underlined. “I posted probably one of the more dramatic ones,” she told AFP, adding that she felt “a lot of anger” building in her since Chaar’s death. “I was very angry that he was being labelled a martyr, because in my eyes, he wasn’t, he was a victim of murder,” she said. Her message was also intended to challenge what she calls a culture of “normalisation” in Lebanon, where a population that weathered a 15-year civil war and numerous car bombs and attacks has learned to go about life after each new incident. “We just get on with our lives. That’s supposed to be resilience, but it’s not, its normalising all this really dangerous violence,” Badran said. Another participant, Carina Aoun, left Lebanon two years ago for Dubai, and posted a message expressing the frustration of many Lebanese who end up abroad. “I want to stop looking for a new place to call ‘home,'” her message reads. “It’s that feeling of leaving because something might happen in Lebanon… it’s unstable,” she told AFP from the Gulf emirate, where she works in advertising. Aoun also objected to those terming Chaar a “martyr,” and said his death hit home for many young Lebanese who imagined themselves in his place. While the campaign has attracted support and attention, it comes at a time when Lebanon is deeply divided. The bomb that killed Chaar was the latest in a string of attacks, many thought to be linked to the conflict in neighbouring Syria. Many Lebanese feel trapped by their country’s political violence but others are directly involved in the long-running fighting in the northern city of Tripoli, or even heading across the border to battle for or against the Syrian regime. Badran acknowledged the campaign’s prospect for short-term change are slim, but said she was heartened by it nonetheless. “If we keep talking about these issues, then maybe we’ll remember to work on them,” she said. Aoun also sounded a positive note.